If you were to ask me to recommend just one book on investing then I would struggle to think of anything better than Joel Greenblatt’s book ‘The Little Book that beats the Market’. It is very easy to read and is not very long. The book does a great job in convincing the reader that investing really doesn’t have to be complicated. Buying high quality companies – defined as ones with a high return on capital employed (ROCE). Buying cheap companies – ones with a high earnings yield. Nearly two years ago I started a trial of three model portfolios based on Joel Greenblatt’s Magic Formula approach (click here to read more about this). I wanted to see how this strategy would work in the real world and with all investing costs such as commissions, stamp duty and bid-offer spreads (the difference between the buying and selling prices of a share) taken into account as many studies of investment strategies ignore these costs. Significant liabilities such as pension fund deficits. Hidden, off-balance sheet debts due to rented assets. I feel that in its simplest form, the Magic Formula ignores cash outlays made by companies and flatters the ROCE of companies that rent rather than own assets. 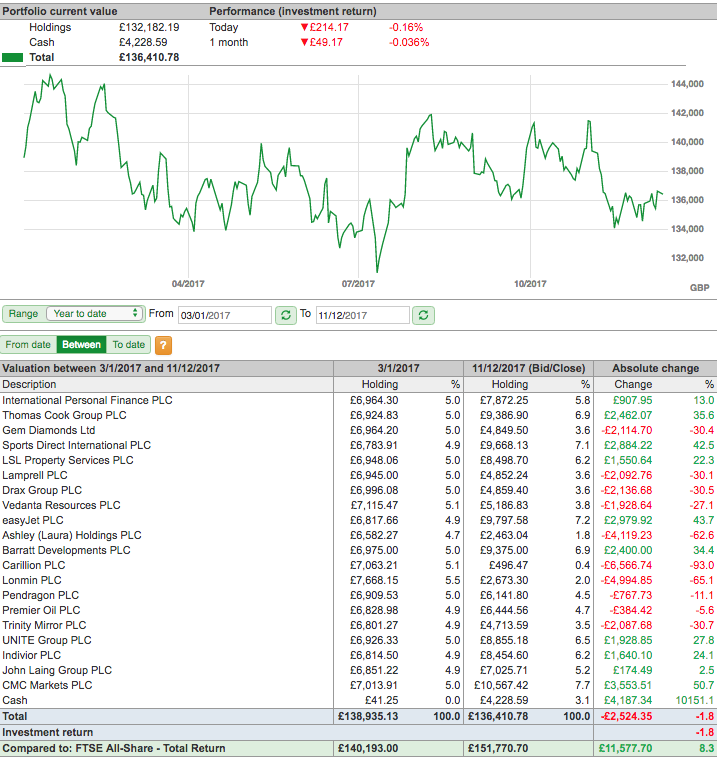 The three test portfolios were set up with £100,000 of money invested in twenty shares from different sectors of the stock market – rather than the unbalanced portfolios that the Magic Portfolio can sometimes suggest – to see which one would perform the best. A simple Magic Formula approach based on Greenblatt’s book. A lease-adjusted version where the ROCE calculation and earnings yield were adjusted for pension fund deficits and hidden debts. A lease-adjusted earnings yield – buying cheap shares regardless of quality. In 2016, all three portfolios made more money than the FTSE-All Share index which delivered a total return of just under 17%. The Lease-adjusted Magic Formula and EBIT yield portfolios trounced that with returns of over 40%. 2017 is not quite over yet but as this is my last article of the year, I thought I would take a look at how these portfolios have been getting on. These three portfolios have been simple buy and forget ones. I have not looked at them for nearly a year and have just asked SharePad to add in the dividends received. Here’s how they have performed. After transaction costs have been deducted, the simple Magic Formula approach has been the clear winner, but the Lease-Adjusted portfolio has also comfortably beaten the stock market overall. After a stellar year in 2016, just buying shares on the basis of cheapness alone has not made money in 2017. 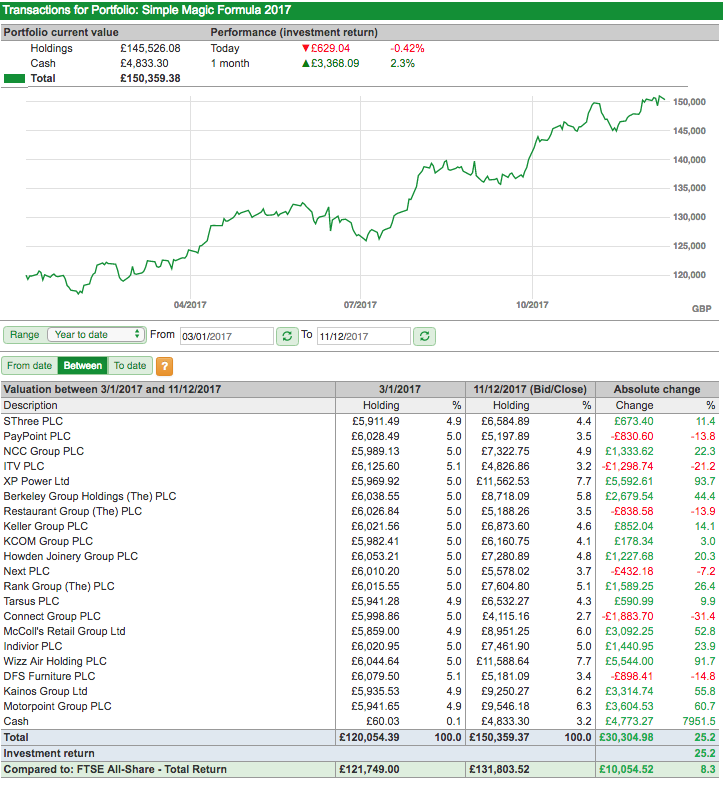 Over nearly two years, the simple combination of an equally invested twenty stock portfolio based on quality and cheapness has trounced the market and has delivered returns that most people would be very happy with. This portfolio delivered a return of 25.2% before costs and 23.5% afterwards. The selling of the 2016 portfolio and the reinvestment into the 2017 one ate up a significant 1.7% of returns and shows quite clearly how the costs of buying and selling shares can negatively impact portfolio performance. The portfolio produced 14 winners and 6 losers. XP Power and Wizz Air were the star performers with share price returns of 93.7% and 91.7% respectively. Connect Group and ITV were the biggest losers with respective share price falls of 31.4% and 21.2%. This portfolio delivered a positive return of 16.1% before costs and 14.9% after them. It produced 12 winners and 8 losers. Softcat was a notable winner with share price appreciation of 73.8%. Motorpoint delivered a gain of 60.7%. 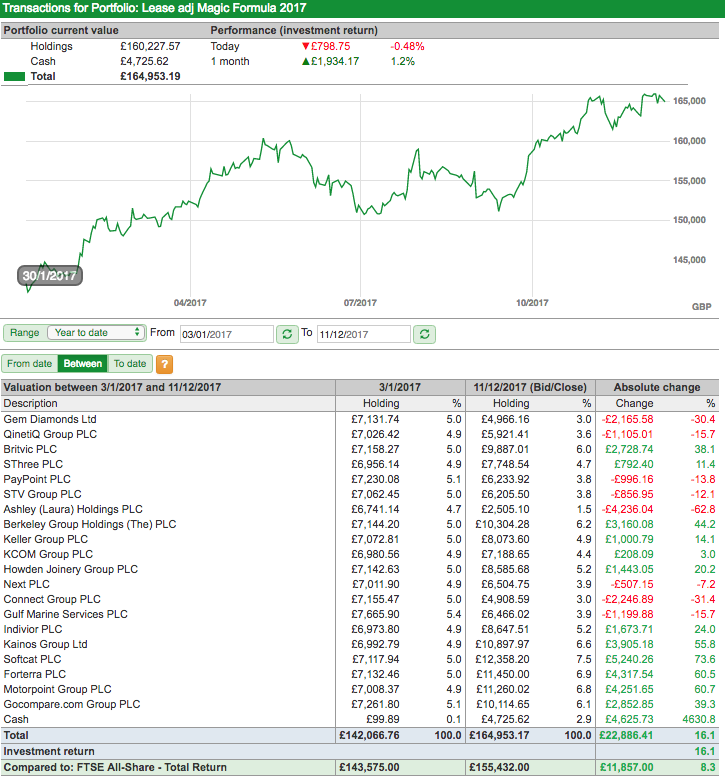 On the losing side, Laura Ashley’s share price fell by 62.8% with Connect Group also contributing a loss of 31.4%. It has been a very bad year for investing on the basis of cheapness alone. This portfolio produced a loss of 1.8% before costs and 2.7% after. Despite being evenly split between winning and losing shares, the losers far outweighed the winners. This portfolio had the misfortune to contain Carillion which saw its share price suffer an eye-watering 93% fall in value. Laura Ashley and Lonmin lost almost two thirds of their value. Have we learned anything meaningful? Not really is my view. Two years is hardly long enough to draw any firm conclusions. What we can say is that this form of Magic Formula investing in the UK has been very successful. I must admit that I find it quite heartening to see that over the last two years adding the criteria of quality into stock selection has had a very positive effect on total returns. This is because the selection of quality companies is central to my own investing philosophy. It’s also very telling that portfolios that have largely been forgotten about for the best part of a year and have not been excessively tinkered with have performed reasonably well. Doing nothing seems to have a lot going for it as an investing strategy. I am going to continue this study in 2018 but am going to introduce two new portfolios. The Magic Formula portfolios will have a momentum indicator added to them to see if buying high-flying, high-quality companies with reasonable valuations adds to performance. There will also be a Quality Shares Portfolio which will contain 20 companies based on ROCE and an ability to produce large amounts of free cash flow. I will write more about this in early January. I hope that 2017 has been a successful investing year for you and wish all readers a happy, healthy and prosperous 2018.